It has been just over one year since legendary comedian Robin Williams passed away, and while some fans are still mourning this loss, some will rest easy by knowing that his voice and likeness won't be exploiting for quite some time. The Sunday Times reports that Disney had been planning a sequel to their 1992 animated classic Aladdin, where they planned on using Robin Williams recordings that never made it into the final movie for this sequel. As it turns out, the actor's will prevents anyone from exploiting his name, likeness or voice for the next 25 years, which lead the studio to scrap their plans. Here's what an unnamed former Disney executive had to say. "When he was on form, the hyperactive motormouth we love from Good Morning, Vietnam, Hook, Dead Poets Society and Mrs. Doubtfire, Robin was making 30 jokes a minute. Now, because he insisted on a final say on such material, [those jokes] will remain in the vaults." After voicing the Genie in the original Aladdin, Robin Williams returned for 1996's Aladdin and the King of Thieves. Dan Castellaneta ended up taking over the Genie voice role in 1994's The Return of Jafar, 1998's Aladdin's Arabian Adventures: Fearless Friends, 2005's Jasmine's Enchanted Tales: Journey of a Princess and the 1990s TV series. All of those follow-ups went straight to video, and it isn't known if this now-scrapped Aladdin sequel would have gotten a theatrical release. It isn't known how far into development Disney was on this Aladdin sequel, or if the studio was planning on bringing back other voice actors from the original cast, such as Scott Weinger (Aladdin), Linda Larkin (Jasmine), Jonathan Freeman (Jafar), Frank Welker (Abu) and Gilbert Gottfried (Iago). Last month, we were treated to a new behind-the-scenes video of Robin Williams recording his lines, which is included on the new Aladdin Blu-ray that debuted last month. The video was first presented on Good Morning America, where director John Musker had this to say about how Robin Williams brought the Genie to life. "He was the Genie, he was bigger than life. We didn't know if he would do it. And fortunately for us, he did. We were totally walking down the plank. If he said no, we were going to be in big trouble because the whole concept was built around Robin. Fortunately he agreed to do it, and he worked so hard. We would record in four-hour sessions. He would be going four hours straight. We would have practically four hours of recording and by the end he was just drenched. He would have so much energy and so much passion." The provisions set forth in the actor's will are unique, but it is believed that they were put in place to prevent the actor's widow and his children from incurring estate penalties because of his posthumous earnings. 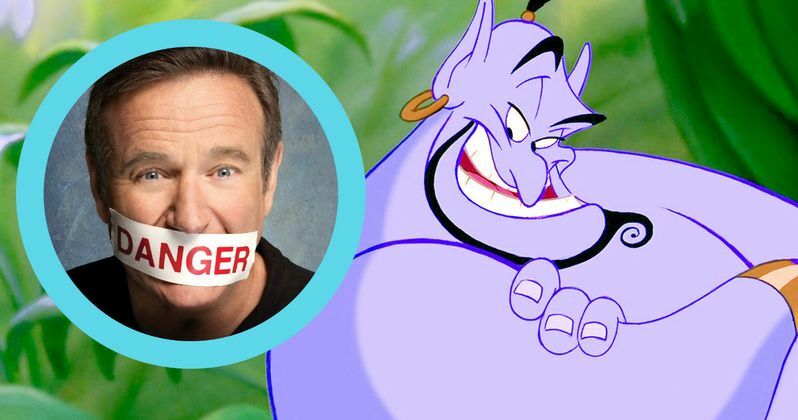 Are you glad that Disney won't be making a sequel to Aladdin with Robin Williams' voice? Or would you like to hear all of the unused jokes that Disney has in their archives?